Released on her own SuperEgo Records, part of the new United Musicians coalition, Aimee Mann shines with complete artistic freedom and control, recording a record of stark beauty. Lost In Space is an immensely moving collection of songs, a soon-to-be classic, the kind of record you can put on to cap a long night, to accompany mid-day thought, or for some weekend relaxation. It is the type of album that is more than the sum of its parts. Mann's voice is the light that guides the ship, though the instrumentation, slightly edgy, for the most part soft and full, brings her life to the forefront and helps really drive it home. By themselves they could be effective; together they are unstoppable. 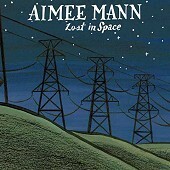 Mann's mid-tempo folk-rock, with a few shots of pop, is captivating. You will certainly not meet one track you don't like. And when the disc is done and the repeat button is hit, you will not mind it, for you will be eagerly anticipating another chance to hear Lost In Space. I'll give it an A.